In our previous three articles, we discussed the value of engaging customers before, during, and after a briefing; either through the guest’s personal device or through a customer portal. What can you do if your guests have restrictions on using their own devices? Or your company prohibits guest access on premises? In this blog article, we discuss strategies and provide a case study on how to manage these challenges without compromising the customer’s experience in your center. Some companies have specific security requirements or other constraints that disallow customers and guests from using their own devices on premises. Additionally, your customers that are from highly regulated industries such as defense, healthcare, and banking may prefer, or not be permitted to use their own devices. We want to share alternative strategies with you for engaging customers before, during, and after briefings. A strategy for engaging customers before a briefing is to ensure that the briefing program pages, on the company website, have a mobile-friendly layout that offers improved readability and functionality when viewed on all devices, including smartphone or tablets. Companies are posting travel information, photos and other general information on the public pages. It is especially efficient when the pages can be integrated with other tools and video feeds. By having a mobile-friendly website, customers can access your website anytime, anywhere, using any device, without compromising the user experience. A disadvantage is that the information is not personalized and content specific to a briefing can’t be shared. Sherrie Williams, Director, Account Management and Customer Programs at Johnson Controls, says the Showcase team is “using tablet technology to reinforce their sustainability values and increase customer engagement.” When guests arrive at the Showcase for Building Efficiency in Milwaukee, they are greeted by tablets at their boardroom seats in place of the traditional tent card, thus demonstrating Johnson Controls commitment to technological leadership at the very onset of the customer experience. The Showcase team uses an integrated content management system (CMS) to streamline the process of creating, editing, and displaying all content that is presented to customer briefing attendees. 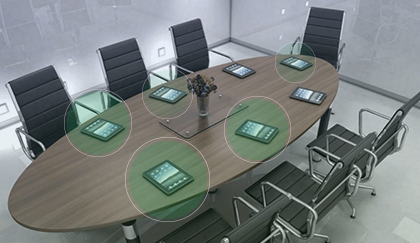 All presentation materials, agendas, and speaker biographies are loaded onto the tablet prior to the customers’ arrival. Guests can consult their tablets for wayfinding, ordering their lunches, and interacting with some of the demonstrations. The incorporation of tablet technology has not only improved the customer experience but also streamlined the Showcase team’s operations. Paper usage has been reduced considerably, content editing is instantaneous through the cloud, and communication is more efficient than ever as customer selections are passed between the Showcase team and facilities through the tablets’ CMS. Another tool of engagement is having an assigned facilitator manage a briefing. Facilitation is an ABPM world class characteristic. A facilitator plays a key role in ensuring a balanced dialogue, keeping the discussion on track, and making linkages to customer business issues throughout the briefing. An ancillary outcome of the facilitator’s role includes capturing commitments and other post briefing action steps. Briefing programs that use facilitators report increased customer satisfaction with the briefing and with the company’s follow-up after their visit. ARTICLE 2: To App or Not to App? Ellen Barnes Pfiffner, M.Ed.,CMM – Ellen is the principal of EBP Business Consulting and offers benchmarking, tools, and consulting to executive briefing programs globally, on-site ABPM Competency courses, and customized training programs including Facilitation Skills. Active in the ABPM for 15+ years, Ellen has published Briefing articles on numerous topics and , has served on the ABPM Advisory Board . She can be contacted at: www.ebpbusinessconsulting.com, Ellen@ebpbusinessconsulting.com, or at 214-789-3571. Darby Mason-Werner, Director, Client Solutions – Darby has been a member of the briefing profession for more than 15 years having built and managed the Xilinx Corporate Briefing Center Program before joining Signet in February 2016. She has been an ABPM member since 2003 and served on the ABPM Advisory Board. Darby is a frequent presenter at ABPM conferences including Core Competency Curriculum courses. She can be contacted at: dmasonwerner@signet.tv or 408-472-8181.